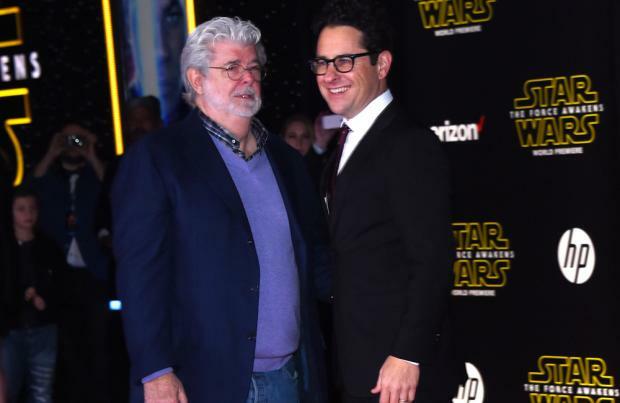 J.J. Abrams and George Lucas walked the red carpet together at the world premiere of 'Star Wars: The Force Awakens' on Monday night (14.12.15). The movie's director was given the seal of approval from the 71-year-old Hollywood legend - who created the sci-fi franchise and directed and produced the first six 'Star Wars' films before selling Lucasfilm to The Walt Disney Company in 2012 - when they attended he highly anticipated event at the TCL Chinese Theatre in Los Angeles. Abrams - who revealed he was overwhelmed at the "surreal" hype surrounding the movie - was given a big thumbs up from Lucas, as he placed a supportive arm around the acclaimed director. Speaking about why the franchise has become such a huge part of popular culture since the first movie came out in 1977, Lucas told reporters on the red carpet: "I didn't think it would be this big when it started. It's a film about families and what one generation leaves behind another generation has to deal with. "I started off wanting to do a film for young people who were going through adolescence, with mythological themes and spiritual themes. "That is what resonated with people." Lucas, 71, talking about how the cycle of life influences the sci-fi saga, he added: "It's about what one generation leaves behind and the next generation has to deal with." The premiere was also attended by the cast of 'Star Wars: The Force Awakens' with stars such as Carrie Fisher, Mark Hamill, John Boyega, Daisy Ridley, Max von Sydow Gwendolyn Christie and Harrison Ford - who was accompanied by his wife Calista Flockhart - all in attendance. The movie opens in cinemas worldwide on Friday (18.12.15).